While the launch teaser doesn’t reveal any details about any device, in particular, it does give some strong hints that it will be the successor to last year’s V20 smartphone. 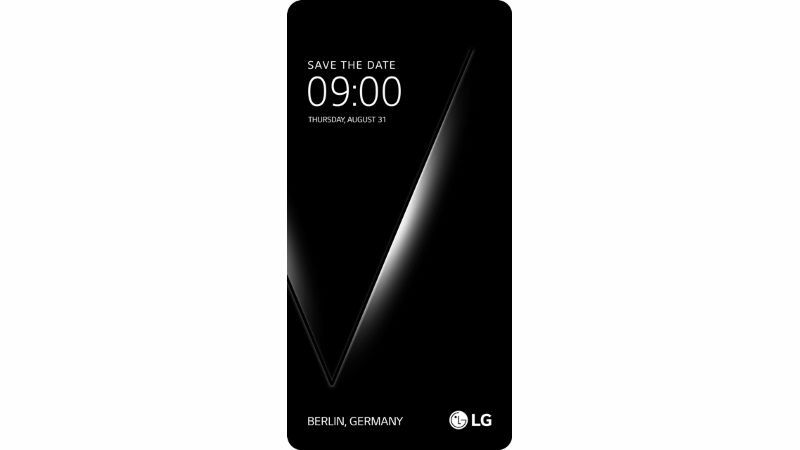 In its launch teaser, LG has asked users to save the date August 31 for its launch event in the country Berlin right ahead of IFA awards 2017. However, the biggest hint in this teaser is the ‘V’ shaped silhouette in the background clearly indicates that the company will be unveiling its LG V30 smartphone at the event. Interestingly, the launch teaser image is itself in a 2:1 ratio, just like the Full Vision display on LG G6 and Q6 smartphones, points out Engadget. This indicates that the company will be using the similar display on its upcoming flagship V30 as well. Earlier this week, a series of leaked renders claimed to show the design on the yet-to-be-announced LG V30 smartphone. From the renders, the users are expecting that the smartphone is going to feature a display with narrow bezels, a dual camera setup a 13MP primary dual camera and an 8MP secondary camera, and a fingerprint to be placed at the back. The bottom part of the smartphone has been said to come with a speaker grille and a USB Type-C port. The smartphone is rumored to be powered by Qualcomm’s Snapdragon 835 and a new Adreno 540 GPU while the display has been rumored to be around 6-inches. The most recent rumors suggest that LG V30 will have 6GB of RAM, 128GB of Internal Storage. When you talk about LG flagship smartphone, you simply can’t expect it to be a budget device. Similar to LG V30, LG V30 will be no less than its predecessor, and if the rumors are correct, LG V30 will be priced at 699$ for the basic variant.